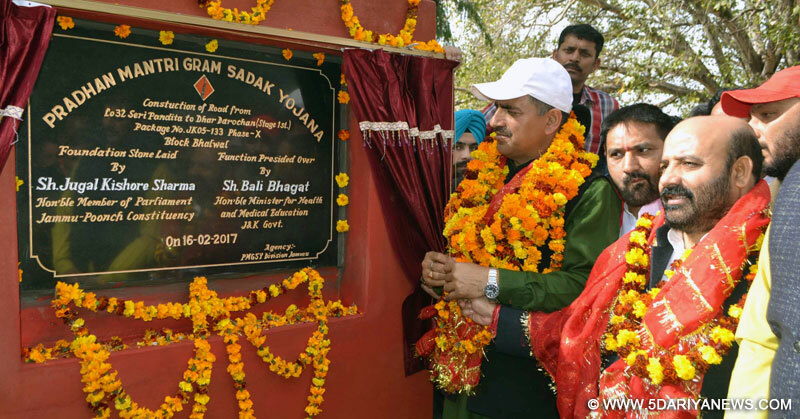 Jammu-Poonch Member Parliament, Jugal Kishore Sharma and Minister for Health & Medical Education, Bali Bhagat today laid foundation of a vital road to provide surface connectivity to Seri Panditan in Raipur-Domana constituency.The 6-km link road connecting Seri Panditan-Dhar Darochan and scores of other villages with Akhnoor road will be constructed at an estimated cost of Rs 5.28 crore under Pradhan Mantri Gram Sadak Yojana (PMGSY) fulfilling long pending demand of the people of the area.Speaking on the occasion, Mr Jugal said the Centre and the State Government are committed to strengthen the road connectivity, which, he said is fundamental to socio-economic development of the people. He said Central Government has been very liberal in providing funds for the development of Jammu and Kashmir to realize the mission of Prime Minister, Narendra Modi ‘Sab Ka Saath Sab Ka Vikas’. He asked people to maintain close coordination with the administration to avail benefits of numerous developmental and welfare programmes. He also asked them to keep close watch on the developmental activities to ensure that the funds are utilized judiciously to create durable assets by the concerned departments.He said during the current financial year, the Central Government has released a whopping Rs 3700 crore to Jammu and Kashmir for the completion of various road projects under PMGSY. He said Central Government is being vigorously pursued to launch new developmental projects in Jammu which is a hub of activities and significant in view of huge influx of pilgrim tourists visiting Shri Mata Vaishno Devi, Sudh Mahadev and Shiv Khori shrines every year.“The Prime Minister and Union Minister for Surface Transport have given assurance to provide adequate funds to upgrade the existing infrastructure and complete of on-going road projects. The work on modernization of Jammu Railway Station will also begin soon which will give boost to the development of Jammu and Kashmir,” he added. The Health Minister, in his address, maintained that the State Government has devised a comprehensive programme for transforming the developmental profile of Raipur-Domana constituency with special thrust on upgradation of road infrastructure. He said five road projects have been sanctioned under PMGSY in the constituency, of which the work has been started on three and the remaining two will be taken up soon. With the construction of Seri Panditan-Dhar Darochan road, there will be great relief to the people of this area which was a long pending demand.Referring to local issues, the Minister said that the entire dry belt of Raipur-Domana constituency is reeling under the paucity of water, which is a major problem. The tube-wells and other water sources are not adequate to meet the demand, especially during the summer months. To deal with the situation, the Government is working on a long-term strategy and concerned agencies are at work to moot a comprehensive plan. He said that a survey is underway to see the viability of lifting the water from Chenab River which will be a permanent solution to the problem. “Meanwhile, the Government will upgrade the existing schemes as also to press into service the tanker service in the vulnerable areas for providing immediate succor to the people” the Minister assured.He directed the PHE functionaries to take immediate steps to ensure regular water supply to the area. He directed for replacing the outlived machinery to augment the water supple.Among those present on the occasion included, senior local leaders Omi Khajuria, Madhusudhan Sharma, Ved Prakash Sharma, Pawan Slathia, Sukhdev Singh, ex-Sarpanchs/Panchs and engineers of PMGSY, PHE and other departments were present on the occasion.